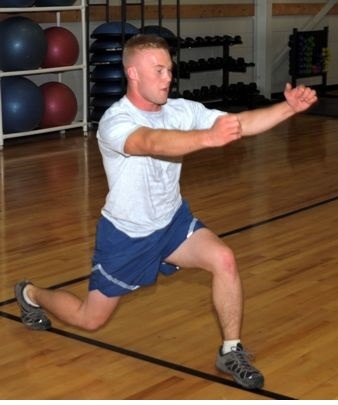 The lunge is a group of exercises which involve positioning one leg forwards with the knee bent and the foot flat on the ground, and the other leg positioned behind. These exercise target gluteus. hamstrings, hips, and quadriceps. Lunges can be performed using your own body weight, or with the help of barbells, dumbbells, or kettlebells. The muscles of your buttocks. The muscles on the rear of your thigh. The muscles of around your hips. The muscles on the front of your thigh. Build Muscle & Burn Fat Fast! Disclaimer: This website and its content, is intended for general information only. This website and its content, is NOT intended to prevent, diagnose, treat or cure any disease or illness. The website and its content, is NOT intended as health or medical advice, and is NOT intended as a substitute for advice from a properly qualified medical professional. The website and its content, was NOT written by a doctor or other medical professional or nutritionist or fitness instructor, etc. Information on this site is the personal opinions of the authors only, and has NOT been reviewed or vetted by a doctor or other medical professional or nutritionist or fitness instructor, etc. Information on this site has NOT scientifically tested or validated. You are STRONGLY advised to consult your doctor if you need health or medical advice, have or suspect that you may have an illness or disease or medical condition, or if you need any form of disease-prevention, diagnosis or treatment. You are also STRONGLY advised to consult your doctor, before taking any action, if you are considering any type of action (including but not limited to: home remedies, lifestyle changes, home environment changes, dietary changes, changes to your exercise regimen, etc.) which may affect your health, or which is intended to prevent, cure or treat any medical condition. The owners of this website are NOT responsible for, have NOT reviewed, do NOT necessarily agree with, and have no opinion on, third party websites which may appear in links or advertisements (including but not limited to: banner adverts, Google AdSense, or a text link). If a third party website is linked, advertised or described on this website, that is NOT intended to mean, and should NOT be construed as meaning, that the owners of this website endorse, agree with, or have any opinion on that website or its content. In general, you should always consult your doctor regarding medical and health matters. ARTICLES & INFORMATION PROVIDED BY THIRD PARTIES ARE THE OPINIONS OF THEIR AUTHORS AND ARE NOT NECESSARILY THOSE OF THE OWNERS/OPERATORS OF THIS WEBSITE.